Includes After Party at Rafter’s Tavern featuring Little Sparrow. Reservations available at The Callicoon Theater, Brownpapertickets.com or by calling WJFF at 845-482-4141. 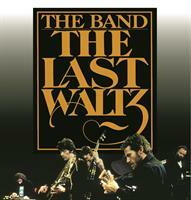 WJFF launches a new Movies & Music series at The Callicoon Theatre with Martin Scorsese’s The Last Waltz (1978) – documenting The Band’s extraordinary final concert celebration at Winterland in 1976. The film is a one-of-a kind music celebration with The Band members Levon Helm, Rick Danko, Garth Hudson, Richard Manuel and Robbie Robertson playing with their friends and reflecting on their history. Special guest appearances include Eric Clapton, Ringo Starr, Bob Dylan, Ronnie Wood, Muddy Waters, Neil Young, Neil Diamond, Van Morrison, Bobby Charles, Dr. John, Paul Butterfield, Emmylou Harris, Ronnie Hawkins, Joni Mitchell, and The Staple Singers. General Manager Dan Rigney says "The Last Waltz is one of the great concert films of all times - documenting The Band at their best playing the music that would influence indie rockers, punk rockers and more for decades to come. Believe me, once the film gets going you will want to sing along. Come join the party and support WJFF"
Reservations for this event include the after party at Rafter’s Tavern, right next door to the Theater. Your first beer is free thanks to Catskill Brewery. Little Sparrow will be there as well to play some of the Band’s classic songs. Donations to WJFF are welcome and there will be some silent auction items. WJFF’s Movies & Music series will bring you more great concert films, documentaries and other music-related movies in the months to come. Look for Bob Dylan in D. A Pennebaker's Don't Look Back (1967) coming up in March. Our thanks to The Callicoon Theater, Rafter’s Tavern and Catskill Brewery for their sponsorship. WJFF Radio Catskill is a non-commercial educational radio broadcaster whose mission is to make available to its community a broad range of ideas and ideals useful to a full and enlightened life. It also aims to involve the community in preserving and transmitting the community’s cultural heritage and artistic expressions in addition to those of the global community and to promote understanding among people of diverse social and cultural backgrounds. For more information, go to wjffradio.org.